The Energy Policy Act of 2005 created the Renewable Fuel Standard, and by the end of that decade, most motor gasoline sold in the United States was blended with 10 per cent fuel ethanol by volume. This article was published by the US Energy Information Administration on August 15, 2018. 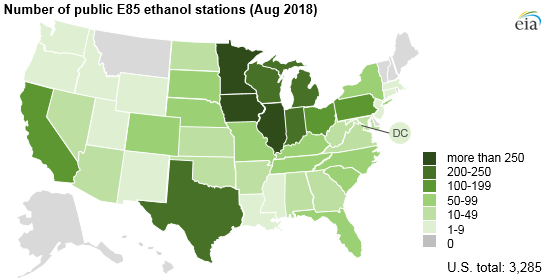 Six states accounted for 72 per cent of US fuel ethanol production in 2016, according to the most recent estimates from EIA’s State Energy Data System. Iowa, Nebraska, Illinois, Minnesota, Indiana, and South Dakota collectively produced 265 million barrels of fuel ethanol out of the US total of 367 million barrels. 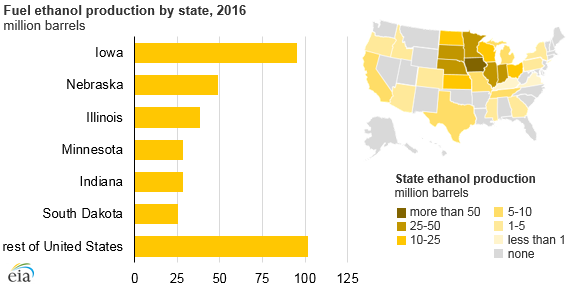 All 6 states are among the top 10 US producers of corn, the primary feedstock for ethanol plants, according to the U.S. Department of Agriculture (USDA). US fuel ethanol production more than doubled from 2006 to 2016. The Energy Policy Act of 2005 created the Renewable Fuel Standard, and by the end of that decade, most motor gasoline sold in the United States was blended with 10 per cent fuel ethanol by volume. In recent years, growth in export markets has contributed to further increases in domestic fuel ethanol production. Iowa’s 41 ethanol plants have a capacity of more than 102 million barrels of fuel ethanol per year. The state’s capacity is nearly twice that of the next-highest state and represents about 19 per cent of total U.S. ethanol production capacity. The state has also received grant money from the USDA’s Biofuel Infrastructure Partnership (BIP) and now has 256 public E85 stations, the third-most in the nation, according to the U.S. Department of Energy’s Alternative Fuels Data Center. E85 is a gasoline-ethanol blend containing 51 per cent to 83 per cent ethanol.